New Hampshire may be one of the smaller states in the country, but it is boasts one of the strongest educational systems in the country. From large, Ivy League institutions to small, nationally recognized liberal arts colleges, the state has 34 higher education institutions. For students interested in attending college in the state, we've compiled a list of resources to help in the decision-making process. Learn more about the top colleges in the state, what it actually costs to attend college in New Hampshire and read about some of the most popular institutions in the state. Although Dartmouth College is the state's most recognized university, the depth of quality universities and colleges expands well beyond the Ivy League. The state is home to public and private post-secondary institutions that offer regionally and nationally recognized academic programs. Prospective students can use the rankings below to gauge the quality of individual schools. To compile this year's rankings, we reviewed and calculated a series of factors, including student-teacher ratios, tuition, graduation rates, and financial aid availability. 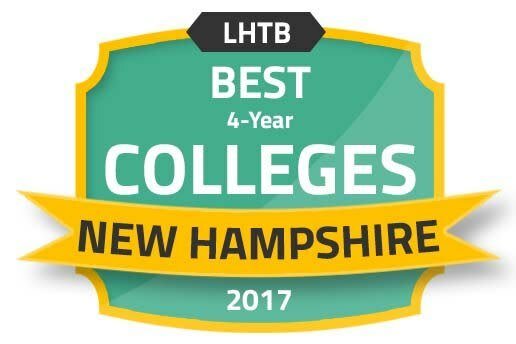 Even though it is one of the country's smallest states, New Hampshire offers one of the most diverse higher education systems. To reach their academic and professional goals, students can select from small, liberal arts-focused colleges to large, public universities. Students interested in colleges in New Hampshire can use the search tool below to learn about and compare different schools, based on location, acceptance rate, enrollment and annual tuition. Whether the goal is to enroll in an applied learning program at a technical institute or an Ivy League institution, prospective students should start the college planning process as early as possible. To improve access to education, instructional quality and college affordability, groups such as the New Hampshire College and University Council and the NHHEAF Network have launched a series of programs to support higher education students. Consisting of three nonprofit groups: Granite State Management & Resources; New Hampshire Higher Education Assistance Foundation; and the New Hampshire Higher Education Loan Corporation, NHHEAF Network provides a variety of online services and in-person events for high school and adult education students. These resources help students prepare for college, navigate the application aid process, get ready for standardized tests, develop competitive application packets, understand college costs and financing options, and choose a major that meets their future professional goals. Federally funded by the New Hampshire Department of Education, New Hampshire Scholars is a community-based program that helps eighth grade students take a rigorous course of study in high school that prepares them for admission to the state's two- and four-year postsecondary institutions. Local business leaders pair with middle school classes, encouraging and mentoring students as they enroll in comprehensive courses in mathematics, science, English, social studies and foreign languages. The Bureau was created to assist non-traditional and adult students to complete academic programs that prepare them for college, technical training and build career readiness skills. Each year, the Bureau provides service to more than 8,000 adult learners across six core programs: New Hampshire High School Equivalency; English as a Second Language; Adult Basic Education; Adult Learner Services; Adult High School; Career and College Transitions. Through these programs, students can complete college pre-requisite courses, learn about college options in New Hampshire, receive career counseling and get help with college and financial aid applications. Pursuing a college degree is an investment in a student's future. Before making a decision, prospective students should learn about how much it costs to attend colleges in New Hampshire and the amount of financial aid available. The charts below compare average tuition rates and financial aid in New Hampshire to national averages. When reviewing colleges in New Hampshire, students should look at the total cost of attendance. This includes tuition and financial aid. We have compiled a list of the most affordable colleges in New Hampshire based on financial aid packages and the total cost of attendance. The most recent data from the US Department of Education's College Scorecard reveals that graduates from colleges in New Hampshire earn competitive salaries that represent a solid return on their tuition investment. Learn more about how New Hampshire colleges rank for alumni earning power and how they stack up against national averages. Attending college in New Hampshire can be expensive and the state has some of the highest student debt rates in the country. College affordability is a central point of concern for prospective students and we've created a ranking of New Hampshire colleges that graduate students with the lowest student debt. When planning for college, students need to look beyond tuition and consider other expenses, such as rent, groceries and utilities. The average cost of living in New Hampshire annually exceeds the national average, which means students need to consider where they plan to live in addition to where they want to go to school. Use the tables below to learn more about how much it costs to live in metropolitan areas in New Hampshire and how the state's cost of living compares nationally. Accreditation is a major indicator of an institution's overall commitment to delivering a quality education to students. New England Association of Schools and Colleges manages the regional, institution-level accreditation in New Hampshire. Attending an accredited school is significant for students that may want to transfer credits to another school or attend graduate school in the future. If students attend a non-accredited institution, their credits may not transfer and they may not be eligible for graduate school admission. Academically, individual degree programs also undergo a review process by accrediting bodies. Below are two examples of program-based accreditation. Accreditation Board for Engineering and Technology (ABET) Accredits the programs for the College of Engineering & Physical Sciences at the University of New Hampshire. Accreditation Council for Business Schools and Programs (ACBSP). Accredits undergraduate and graduate business programs for Southern New Hampshire University. The state's capital, Concord is a smaller city with approximately 43,000 residents. Yet, it has a strong higher education presence. Students can select from public and private two- and four-year colleges and universities. In addition, students may also attend professional training programs in physical therapy (Franklin Pierce University), as well as law -- University of New Hampshire (the state's only school of law). Concord embraces education, evidenced by nearly 45 percent of the population age 25 and older holding a college degree. Graduates can pursue career opportunities in several major industries, including transportation and healthcare. Founded in 1965, NHTI is a two-year public community college that has a student body of approximately 4,600 students taking day, evening, weekend and noncredit classes. The college offers 90 academic degree programs, including 41 associate, 47 certificate and two professional certificate areas of study. Professional certificate majors include dental assisting and diagnostic medical sonography. The school is home to more than 400 faculty members (110 full-time and 300 adjunct), five academic buildings and a 16,000-square foot student center. One of four institutions in the University System of New Hampshire, Granite State College is a public university that was founded in 1972. It has an articulation agreement with the Community College System of New Hampshire and offers six associate degree programs, 27 undergraduate degree programs and seven master's degree programs of study. Additionally, the college has a range of online degree programs for students seeking learning flexibility. As the largest city in the state, Manchester has grown to more than 110,000 residents, according to New Hampshire Employment Security. The city itself is an educational hub. Nearly 87 percent of residents have graduated from high school and 26.4 percent of the population over the age of 25 has earned a bachelor's degree or higher. Serving the area are four career technology centers, community colleges and four-year public universities. These colleges produce graduates ready to work in the area's major industries, including banking, healthcare, communications and engineering. A Benedictine liberal arts college, Saint Anselm College was founded in 1889. It is a member of the National Catholic Educational Association. Approximately 2,000 students attend classes across the college's 45 majors and 42 minors. In addition, it offers pre-professional programs in medicine, theology, engineering, law and dentistry. Manchester Community College has an enrollment of 3,200 students with nearly 1,000 students enrolled in online programs. The college offers more than 60 associate degree and certificate programs. Its major programs of study include liberal arts, business and automotive and construction technologies. Nearly 40 percent of the students are under the age of 25 and 77 percent of classes have 19 or fewer students. Southern New Hampshire University is a private, non-profit university with an enrollment of 3,000 on-campus students and over 60,000 online students. Its 300-acre campus in Manchester complements its status as a major online education university. There are more than 200 areas of study in the school's online arm. Both on-campus and online, students can select from degree programs at the associate, bachelor's, graduate and certificate levels. There are numerous resources for students preparing to attend college in New Hampshire. The following resources can help students along each step of the college-planning process. An online resource of the NHHEAF Network that includes college-planning resources, tips on choosing a college, information on what to expect in college, as well as college funding and financial aid resources for parents. The state agency that oversees and regulates postsecondary institutions in the state and offers student resources including financial aid and veteran education resources. A nonprofit organization that helps students that come from disadvantaged backgrounds to develop skills and gain access to the resources necessary to succeed in a postsecondary education setting. A special project from the New Hampshire Department of Education, Next Steps works to improve the college readiness of students who are at risk of dropping out of high school or have disabilities. Reaching Higher New Hampshire is a local advocacy program that supports higher education in the state through legislative advocacy, student and teacher grants, newsletters and community events.